The story of our multi arch dam dates back to 1885, when a Redlands farmer by the name of Frank Brown built a rock dam at Big Bear which created the lake that we have today. The original rock dam under construction at Big Bear Valley in 1884. — Rick Keppler Collection. This original rock dam still exists today, about 50 yards upstream from our current dam, and under about 20 feet of water when the lake is full. Brown’s rock dam was a thin structure with no reinforcing iron, and very little cement. It was constructed entirely out of rock blocks that had been cut from the surrounding hillsides. Cement was used only to hold the blocks in place. In 1885, at the time this dam was constructed, it was holding back the largest man made lake in the world. It was considered a marvel of engineering. The strength of this dam came from the shape of it’s arch. Even though this thin rock dam at Big Bear seemed to be holding strong, plans to build a stronger more modern structure were being discussed almost immediately after it was built. Several false starts were made over the years, but it wasn’t until 1910, that construction of the dam that we have today actually began. 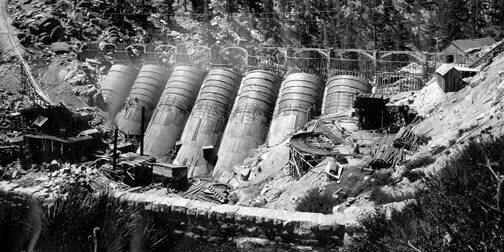 The main problem that prevented construction of a new dam at Big Bear Lake was money. The Bear Valley Land & Water Company that had built the rock dam in 1885 had gone bankrupt. In 1903, the Bear Valley Mutual Water Company was formed. This new group paid off old debts, and took over the lake. By 1909, they had enough money to begin construction on a new conventional but expensive gravity filled rock dam. It was at this point in time that a guy by the name of John Eastwood stepped forward with a radical new design proposal. His unique design called for an all concrete structure without any rock or dirt fill. Eleven concrete buttresses would be built across the gorge about 35 feet apart and about 50 yards downstream from the existing rock dam. Between each of the buttresses a concrete arch would be built. In essence Big Bear would have ten smaller but stronger arch dams across the valley instead of one large one. More importantly Eastwood’s design would cost about 30% to 40% less than a conventional design. Eastwood began construction in 1910. By 1912, his dam was finished. At a cost of $138,000, Eastwood’s dam stood twenty feet higher than the old rock dam, but it increased the capacity of the lake by almost three times. Additional photographs showing the construction of Eastwood’s dam can be found on the right side of this page in the Eastwood Dam link under “Photographs”. 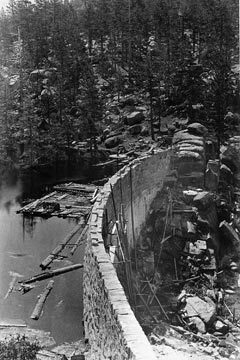 Eastwood’s multi arch dam under construction at Big Bear Valley in 1911. — Rick Keppler Collection. 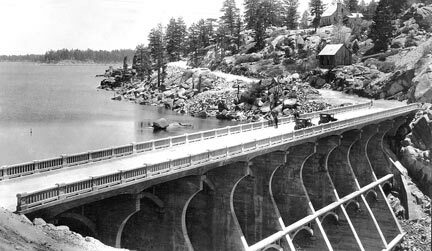 The multi arch dam at Big Bear Lake in 1914, before the bridge was added across the top. — Rick Keppler Collection. Eastwood didn’t design his Big Bear Lake dam with the intent of ever putting a bridge across the top. There was no reason for one at that time. After all, the Rim Of The World Highway into Big Bear entered our valley at Fawnskin after going through Holcomb Valley. It then continued east around the lake to the Big Bear Village. There were no roads to the dam, on either side of the lake in 1910. This all changed by 1924, when San Bernardino County decided to shutdown the section of Rim Of The World Highway from Running Springs through Holcomb to Fawnskin, and build a new route from Running Springs through Snow Valley to the dam at Big Bear Lake. This new highway would continue past the Big Bear dam along North Shore to Fawnskin, and then east around the lake to Big Bear Village just like it always had. The county also announced that a new road along the south shore of the lake from the dam to Big Bear Village would also be built. Most recorded Big Bear historical information tells us that the reason for a new south shore road was because Big Bear Village merchants and residents argued that since Fawnskin residents had a road along the north shore to the dam, the south shore residents were entitled to one also. To put it politely, this is not accurate. At that time, it really didn’t matter much to the village merchants who were already on the Rim Of The World Highway if there was another road to the dam. The Rim Of The World may have entered the valley at Fawnskin, but it also entered the valley on the south side of the lake near Big Bear Village after coming up from Redlands. When San Bernardino County Engineers originally considered the plan for a south shore road, they dismissed the idea because it was determined that it would be extremely expensive to build and maintain because of the steep rocky terrain. It was also pointed out that the Big Bear Lake dam had not been designed to handle the extra weight of a bridge. More importantly, San Bernardino County didn’t even own the dam. It was privately owned by the Bear Valley Mutual Water Company. The county didn’t have the right to authorize the construction of a bridge across the top of a dam that it didn’t own. So if all of this is true, then how and why did the south shore road at Big Bear Lake ever get built? Well it turns out that most of the land along the south shore of the lake between Big Bear Village and the dam was undeveloped and privately owned by the water company and a couple large land owners. Those few land owners would benefit greatly by a new south shore road. Property values on that side of the lake would sky rocket. Today, we can only imagine the private deals that were made while lobbying with the San Bernardino County Board of Supervisors, because in hardly no time at all, the county not only approved funds for this unnecessary road, but they also agreed to pick up the cost of a bridge if the water company would agree to donate an easement across the top of the dam, which they did. But that’s not all. The easiest and least expensive route this road should have followed, would have been along the shoreline. However the groups who wanted this new road, also owned that undeveloped land along the shoreline. The last thing they needed, is a county highway crossing their property. So believe it or not, on top of everything else, this enterprising group of land owners convinced the county to pick up the additional cost of a much more expensive route, higher up through the mountains, that would bypass the valuable lakefront land. So the next time you are drive to the dam notice that after passing through Boulder Bay how the highway heads up into the mountains. We now know that it was strictly politics, not engineering or cost considerations, that made this south shore road a reality. 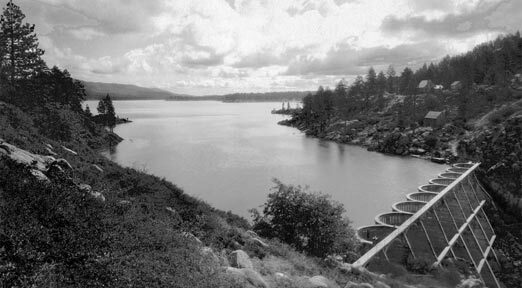 The multi arch dam at Big Bear Lake in 1925, one year after the bridge was added across the top. — Rick Keppler Collection. As a result in 1923, the Big Bear Lake dam was a lone monument standing in a pristine wilderness. By the end of 1924, when bridge across the dam was completed, the scene was completely different. It was now a major junction for two different highways through the mountains.